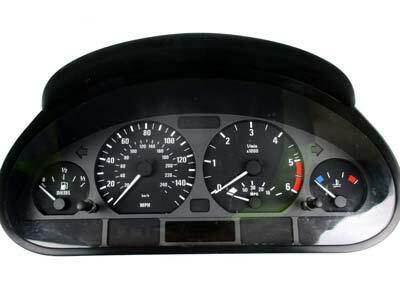 The instrument clusters on the BMW 3 Series have been known to commonly fail under varying conditions and the most common issue found with these instrument clusters are gauge failure due to the breakdown of internal components. This fault is known to start intermittently, however, when not treated, can cause the faults to become permanent. If you find that you have a faulty instrument cluster unit, the first option that you may have been advised of is to have the unit replaced. While this may seem like the easier and quickest option, it can also work out to be costly due to the additional expense of having the unit coded / programmed to your vehicle. Another alternative option available is the purchase of a second-hand used part which comes with a limited warranty, generally, only 30-90 days and this will also need to be coded / programmed to your vehicle at an additional cost, as well as further costs of the unit being calibrated to read the correct mileage. My BMW 3 Series Instrument Cluster is Faulty – How can Sinspeed Help? If you find that your BMW 3 Series Instrument Cluster is faulty, you will be pleased to know that we are able to fully test & repair your own unit using only genuine OEM components, which will meet and exceed OE specifications. Not only this but all of our repaired dashboard speedometers will also come with a Lifetime warranty and will not require coding when refitting back to your vehicle. A professional fitting service is also available if required. We have compiled a list of the most common failing part numbers that have been repaired in our workshop recently. This is not a complete list, so if you find that your part number is not on here, please call us on 0203 815 9441 to confirm. Tags : 0263 360 346, 0263 606 200, 0263 606 220, 0263 606 221, 0263 606 245, 0263 606 255, 0263 606 256, 0263 606 265, 0263 606 274, 0263 606 275, 0263 606 284, 0263 606 291, 0263 606 299, 0263 606 300, 0263 606 309, 0263 606 311, 0263 606 327, 0263 606 336, 0263 606 345, 0263 606 346, 0263 606 347, 0263 606 363, 0263 639 005, 0263 639 006, 0263 639 022, 0263 639 082, 0263 639 100, 0263 639 118, 0263 639 119, 0263 639 162, 0263 639 164, 0263 639 186, 0263 639 187, 0263 639 204, 0263 639 239, 0263 639 276, 0263 639 303, 0263 639 337, 0263 640 013, 4 117 710, 4 117 712, 4 117 755, 4 117 756, 6 901 925, 6 901 926, 6 902 366, 6 902 376, 6 902 377, 6 906 870, 6 906 878, 6 906 879, 6 906 884, 6 906 893, 6 906 894, 6 906 903, 6 910 261, 6 910 270, 6 910 279, 6 910 281, 6 911 290, 6 911 291, 6 911 292, 6 911 308, 6 915 242, 6 915 243, 6 915 259, 6 931 247, 6 931 265, 6 932 898, 6 932 899, 6 940 872, 6 940 907, 6 956 997, 6 985 650-01, 6 985 684-01, 7 834 223, 8 387 608, BMW 3 Series Dashboard Failure, BMW 3 Series Dashboard Repair, BMW 3 Series Instrument Cluster Failure, BMW 3 Series Instrument Cluster Problems, BMW 3 Series Instrument Cluster Repairs, BMW 3 Series Speedometer Repair. We’d be happy to take a look at this for you. I have sent you an email with full information and pricing for the test & repair of the instrument cluster. If you have any questions, please reply to the email and we’ll be happy to assist you.